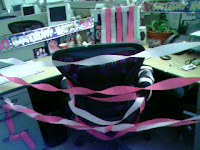 This is what greeted me when I came into work this morning. And all the goodies weren't to celebrate this, my (drum roll please) 200th post. My girlfriend at work decided to honor me for hitting the big 3-0. Mind you, my birthday was nearly two weeks ago. She was being selfish...today's her big 4-0 and she was trying to divert attention from her landmark day. And sadly, for the most part, it worked. But it didn't bother me. I love a good party...no matter what the reason. today's good: Who can work when there's a party going on?!?! And especially when the party involves two cakes! Oh and even not feeling well, I ran last night. Probably made it worse, but I went running! today's bad: Well my migraines and nausea are now accompanied with chest pains and labored breathing (sorry dear cousin, I'm not preggers). It's a huge task just to take a deep breath. Not good when dealing with Grandma2Amara always consists of me counting to 100 (not the usual 10) to calm down. Maybe you should get yourself checked out nik! And then you'll join the multitude of pill popping females in our family!